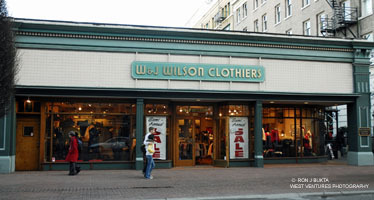 Wilson’s is Victoria’s oldest firm of clothiers, founded in 1862, the year the City was incorporated. They have always conducted business from this location. This building was the result of a complete rebuilding of an earlier one, that may have dated to the late 1870s. The building reflects the growing confidence in the City of Victoria at a time when many older buildings were being replaced by Edwardian-styled masonry and stone structure. When the streetcar came past in 1907, the older building was still there. Today, the firm still operates from the historic location.